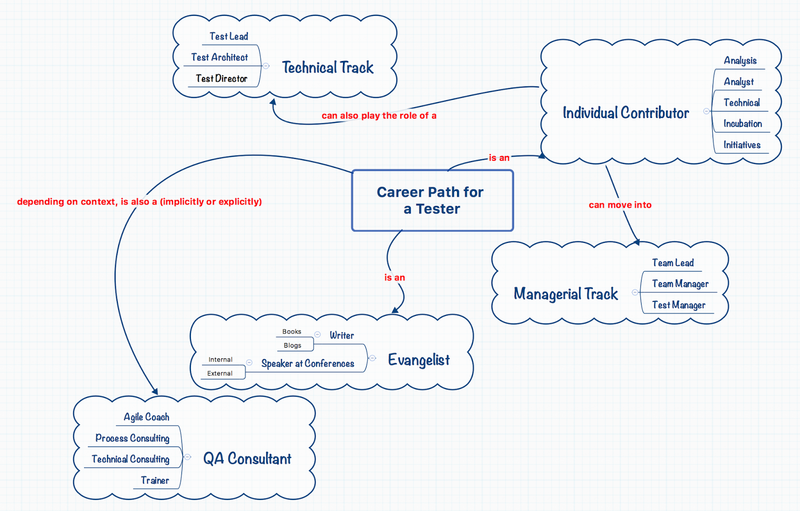 Essence of Testing: Career Path of a Tester! PS: This is a long post. You can can also get / read a pdf version of this from here via slideshare. Thanks to all who replied and have shared deeper insights into different perspectives. I agree with most of the thoughts and also think that the answer to the question is "It Depends!" Before I proceed further, I want to share my perspective on what I think are the options for “testers” in the Software Industry. 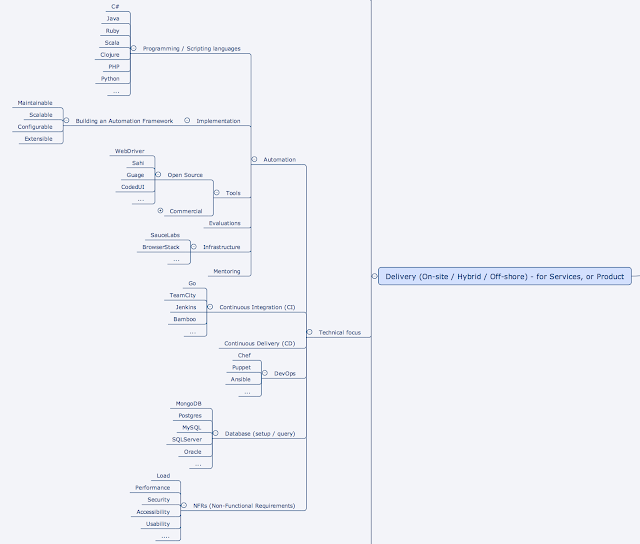 In terms of Career Path options - I think the options are in a way clear as depicted in the mind map below. Moving along the Career Path is almost natural as you spend more time in the industry. However, to become successful along the way, there is a lot of hard work required. There are various capabilities and skills that a Tester needs to be successful in his / her career - including but not limited to the few options shown below. These skills are more from a Individual Contributor / Technical Track perspective. The Capability and Skills would differ "slightly" based on the nature / operational model of the organization you are working for. Coaching and Consulting focussed-roles would predominantly require strong soft-skills, but the importance and value of Technical Understanding cannot be underestimated. Often unfortunately, I have come across 'consultants' who know only theory, and very little practical experience of implementation. In such cases, you care not doing justice to your role. At the same time, I have come across brilliant Consultants who bring in a wealth of experience and knowledge (what has worked, and not worked) and apply it in the correct way in the present context. It was indeed a pleasure to work with such Consultants! The path of the shift-left is extremely important and also not easy. You need to apply a different mindset to accomplish activities that helps build a better software even before any code is written. A Tester cannot be complete without doing well in the core skills - Testing! Testing is complex, frustrating, tedious, slow, negative to a certain extent - finding mismatches in actual Vs expectations and can never say its 100% complete! Yet, it is a lot of fun. You get to learn a lot of things, use a variety of tools to help your Testing efforts. When the software is built right, and the end-user is able to do what is expected from the software you have helped build and test, Testing is also very rewarding! Unable to work as ONE TEAM! Software Development is a highly technical activity. There is no reason why Testing should be considered as a non-technical activity. There are other activities that a Testing can be part of - these are related to Learning, Sharing, Mentoring and Contributing to make the Testing space more richer! 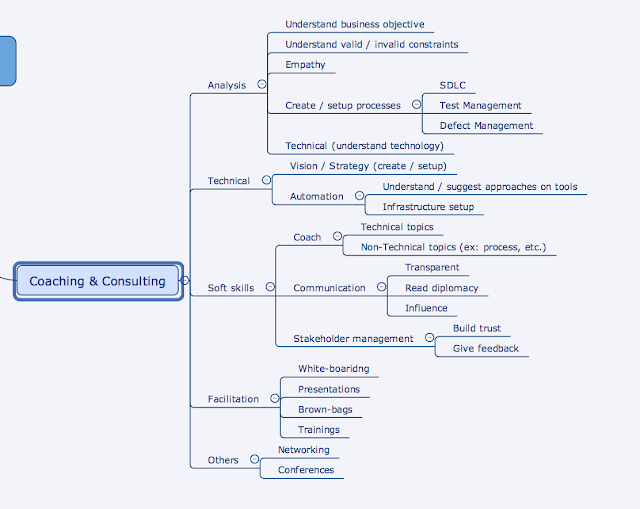 Another way to visualize these skills and capabilities is to think of this as a pendulum. So eventually you will end up in a T-model - the short horizontal line representing the breadth of coverage across all aspects of how you can help build a 'good' quality product, and the vertical line representing the 'deep' level of mastery and expertise you have. Now that this is out of the bag - I want to highlight a few things that I have observed in the Software industry, and this is probably not limited to just the Tester role. People are impatient and quickly want to move up the chain along the career path track. Motivation could be, but not limited to - Money and Power (to control). I would ask these people to do a serious introspection to figure out if they are truly doing justice to their role and their peers, Are they able to be good role models for the people “reporting” to them? Career Path is necessary, but overrated. Too much emphasis is given on the “role” and not enough on the activities required to make the team successful, and make the product that will help the end-user. Focus on the big-picture, and your career will grow automatically. We try to copy what others in the industry have done in their career, This is an easy way out. Instead, I recommend you understand their journey, the hard work your role-models have put in their life to get to where they are. I encourage each of you to spend some time understanding this, and then work with your mentors and people you trust to see how you can create your own path. That way, your life, journey and destination will be unique! Testing is NOT only about finding / reporting defects. Help build a “ONE TEAM” culture! Does a Tester need a Career Path?